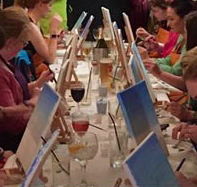 ArtVine is an Sip and Paint class held in charming, proper pubs. As it says, this is art time and wine sipping, also known as a Brush Party or Pop-up painting lesson. Absolutely no artistic talent is required, the emphasis is on fun! 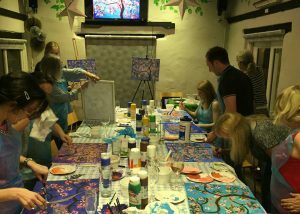 Come and join in this sociable evening event where you can find your inner creativity by painting your very own piece of art, while sipping a glass of wine or 2! I will provide everything you need: art teaching, paint, canvas, easel, brushes and apron. (Although I will provide aprons, I suggest wearing old clothes). The bar provides your other essentials (drinks not included in the ticket). You will follow the clear step-by-step instructions given to produce your own unique painting. Progress is easy with this style of art session. It does not matter if you are a beginner or more experienced painter, you will enjoy an evening of fun and creativity as I lead you from a blank canvas to the completion of your own masterpiece. I want to encourage that inner artist of yours with a colourful and composed painting suitable for all skill levels and take you through your creative journey with clear friendly instruction and information. I also want you to leave with a smile on your face as well as your masterpiece in hand! Unlike some other similar events, that pack in table easels back to back, we lay out the table like a tea-party so you can easily talk to everyone else there, sharing the paint around. We think this is a much more sociable way to do it. Smaller numbers also mean we can do more one to one time to help you out. Every week we also put in some useful painting techniques for those that want to know more, but with absolutely no obligation to take them on board! You arrive around 7.15 pm to sort your drinks from the bar, then ready for 7.30 pick a seat with your drink and start painting. You have a comfortable 2 and a bit hours to easily replicate the painting of the night. Places are limited and must be booked in advance to secure your place. Booking is through Eventbrite, £25 per ticket. (Drinks are not included in the ArtVine ticket).